HOUSTON -- Two of Russia's most flown rockets -- responsible for nearly one-third of the global launch rate over the last few years -- are grounded in the aftermath of consecutive mishaps that spoiled the mission of a communications satellite and a resupply flight bound for the International Space Station. The Proton rocket's Breeze M upper stage was the culprit in an Aug. 17 failure that stranded a Russian government communications satellite in the wrong orbit. Less than a week later, a Soyuz rocket's third stage cut off early, the booster fell short of orbit and destroyed a Progress cargo freighter headed for the space station. The flights originated from the Baikonur Cosmodrome in Kazakhstan. Both launchers are now grounded, leaving crews and supplies without a way to reach the space station and placing commercial satellite launches in limbo for customers around the world. Derivatives of the Breeze upper stage and the Soyuz rocket at fault for this month's anomalies were aboard 13 orbital rocket launch attempts this year. In 2009 and 2010, the components believed to be culpable for this month's failures helped approximately one-third of all global space launches reach orbit. The Breeze M mishap deposited Russia's Express AM4 satellite in a lower-than-planned orbit in mid-August several hours after the Proton rocket lifted off. Russian engineers are investigating the cause of the rocket failure while the Breeze M stage remains grounded. After a Proton booster propels them into space, commercial communications satellites use the Khrunichev-built Breeze M upper stage to reach high-altitude transfer orbits en route to the operational positions 22,300 miles over the equator. International Launch Services sells commercial flights of the Proton/Breeze M to satellite operators around the world. Commercial ILS Proton missions were scheduled to launch QuetzSat 1 and ViaSat 1 in September. The satellites are designed to beam direct-to-home television programming to Mexico and provide the United States with high-speed broadband Internet services, respectively. Including flights for commercial customers and the Russian government, the Proton rocket was scheduled to launch up to twice a month for the rest of the year. No one can say what delays, if any, will affect the Proton manifest in the wake of the Aug. 17 failure, but Russian officials suspended preparations for upcoming launches while the inquiry is underway. The Soyuz rocket family has also been grounded. 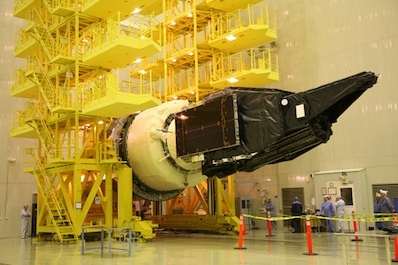 The first mission to face a delay was the planned launch of a Russian Glonass navigation satellite Aug. 25. Russian officials postponed the flight until September, even though it uses a different type of third stage than the one believed to be at fault for the failed Progress cargo launch Aug. 24. The third stage on the Progress mission was powered by an RD-0110 kerosene-fueled engine. Early data suggests the engine turned off after computers detected a lower-than-expected pressure reading in the third stage fuel system, according to NASA and Russian media reports. The Progress launch flew on a Soyuz-U rocket. Crewed flights use a nearly identical third stage on a rocket configuration called the Soyuz-FG. Because of the similarities, Russia could announce this week that the next trio of astronauts and cosmonauts flying to the International Space Station will remain on Earth while investigators determine the cause of the anomaly and take corrective actions. NASA astronaut Daniel Burbank and and cosmonauts Anton Shkaplerov and Anatoly Ivanishin were scheduled to lift off Sept. 22, Baikonur time, and reach the space station two days later. 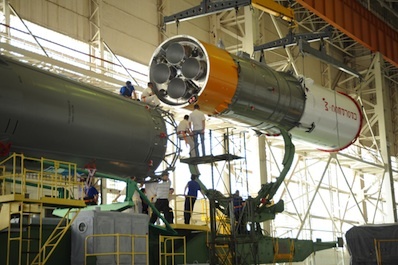 The tentative plan calls for resuming Soyuz flights with the RD-0110 third stage engine in October, first with a commercial launch of six Globalstar communications satellites, then another Progress logistics delivery mission. The next space station crew would follow the two unmanned flights, according to the proposed schedule.